The user guides for the 2018.2 build of the Virtuo MIS FMS Asset Management module are now available through the Medi360 portal! To download the files log-in to the Medi360 portal. From the Downloads menu, choose User Guides. Under Suite, choose MIS Financial Management, and click on Apply Filter. Click on the title of the file you want to download to open its Download Details page. From there, click on the file name (e.g. 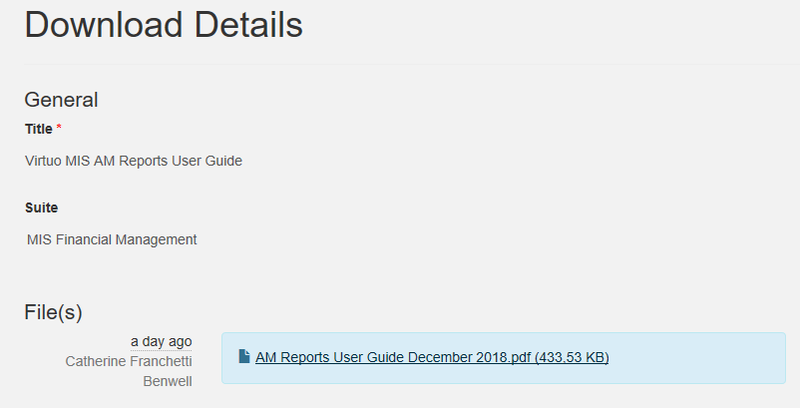 AM Reports User Guide December 2018.pdf) to download the guide. NOTE: User Guides for all other Virtuo MIS Finance Management modules may also be found in the Downloads section of the Medi360 portal ! Virtuo MIS Asset Management fully automates the management of fixed assets (depreciable and non-depreciable; capital and non-capital) through the complete asset lifecycle - from acquisition to disposal - to reduce manual effort and increase efficiency.